This is the first AFT appearance of new companion Jess. Her first outfit is Princess Leia’s slave girl outfit in Return of the Jedi. Appropriately that is the figure I have used as the basis for all my female figures. Jess’s main outfit was straight out of the next directory. The Tarcalians Brox and Beeble use the Anakin Skywalker figure from The Phantom Menace with a sculpy head. Their names come from the Hitchhikers Guide To The Galaxy character Zaphod Beeblebrox. I think they’re really cute and they were set to return in an episode of my abandoned Torchwood series. The story was originally posted in May and June 2003. With the format of the AFT established it was time to strike new ground and create adventures for the (then) current Doctor. As previously stated, the McGann stories were a direct continuation of adventures I'd been making as toy videos for a number of years. To me, the Doctor's companion Dari was already established but the new audience of AFT readers, I wanted a new companion that they would meet from the very beginning. In order to make her different to companions of the past I created the conceit of Jess possibly being her own great grandmother. The ongoing series had it continued would have had an emphasis on relationships within the TARDIS, an angle hinted at by the TV Movie and certainly picked up on when the series returned to our screens. Jess would have had a crush on the Doctor, Dari would be enamoured with Jess while the Doctor was oblivious to any human emotions. The aim would be to set up some real human conflicts in addition to the dangers posed by the monsters of the universe. The outside of Space Mall was a giant piece of polystyrene packaging. 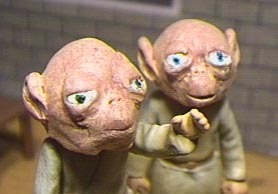 The inside were the first glimmerings of something that would become a staple of the Action Figure Theatre, the printout set. In this case it was a simple shopfront printed in black and white onto yellow and orange card. The photo of Jess’s great grandmother is a picture of the Jess figure that’s been doctored to give it dark hair and a ‘silent movie’ look. 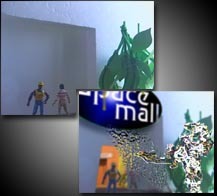 Early drafts of the story shifted locations several times from a museum to a theatre before settling on the rather more incongruous shopping mall. Jess herself went through several names including Roxy and Isis. Her 'slave girl' outfit was done in photoshop. The If creature was realised by using the 'glowing edges' filter in photoshop. I tried a couple of ways to make the base creature. Had the series continued as planned, Jess fate would have been a constant issue as every time her life is threatened, so is the causal nexus from the ensuing paradox.